A cook is the second most important person onboard a ship, as the saying goes. And of course, it´s a pretty true thing. Not a few mutinies or even complete ship´s losses can be traced back to the failure of the ship´s cook to provide sufficient meals for the crew. Why´s that? An empty stomach won´t helm a steady course, won´t calculate a ship´s position and won´t climb the mast during heavy weather. Having a great cook and a great skipper is the first step to master all challenges. Is one of them wash-out: Well, have a prayer. Just try to buy Organic Food – or “Bio” as it is called here in Germany. It´s just better for you. Of course, we have been lucky that we didn´t encounter such severe conditions during our SKS-class (this German certification is in some terms comparable to the RYA Coastal Skipper examination) but nevertheless, after some 10 hours of sailing, casting off, landing, MOB Figure-8s and permanent concentration the crew of SY MERENNEITO too was very hungry and longing for sustainable, tasty food rich of content. 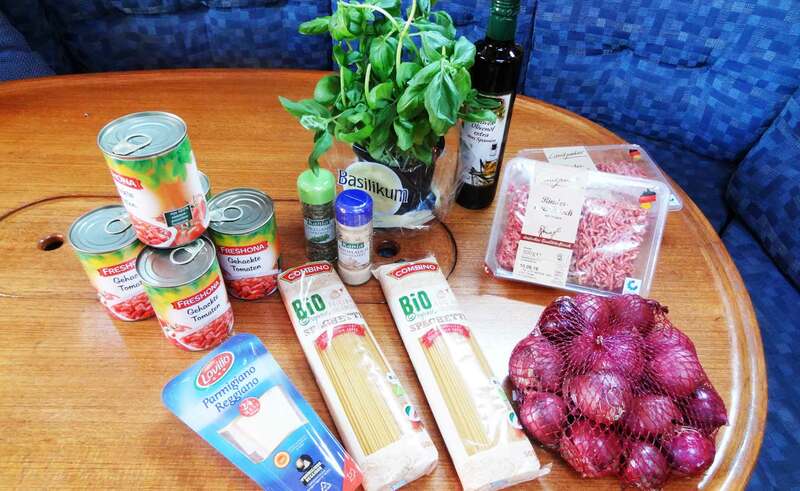 So, here´s a recipe for Spaghetti Bolognese á la X-Yacht: Easy to prepare and with a guarantee of success. Cooking is a social event. Back until ancient times the process of preparing food brought together people, it had a socializing effect. That´s perfectly the same for a yacht: Before we are able to prepare the food, we have to go “hunting”. That´s in our modern world pushing a cart through the cramped supermarkets. Which can be tiring as some marinas are well outside the commercial centers of the towns or are situated in areas where there are none. We have been lucky: One of our crew mates had a car available. This is essentially what you need to buy. Of course you want to serve best quality to your crew and guests. So from my point of view, you should always opt for organic quality when buying stuff. Especially when it comes to the fresh ingredients like minced meat and carrots you, the crew and your guests will certainly notice the difference in taste! 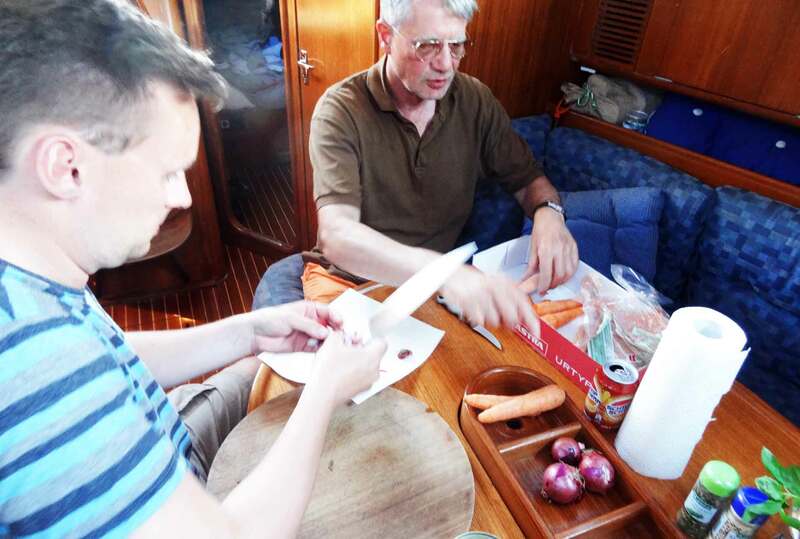 First step in preparing this onboard food is to have some people mincing the fresh ingredients. Grab somebody who will hackle the onions first. 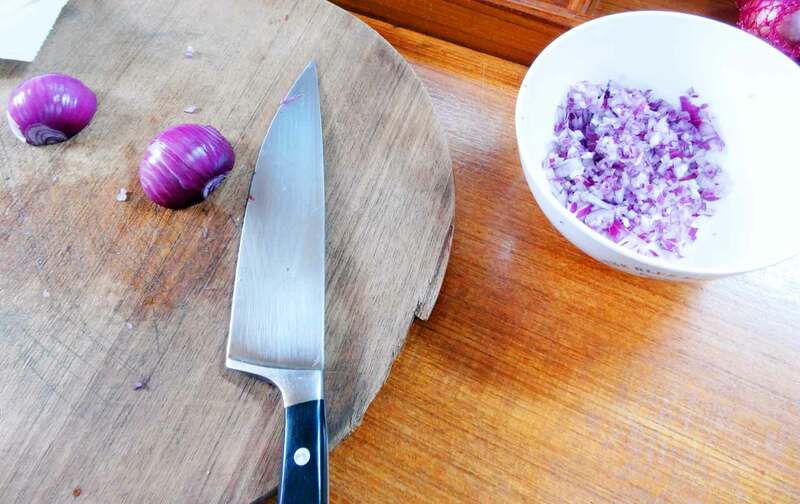 You will need small cubes of onions, when cooking for four persons not less than 3 mid-sized onions should be minced. And yep, there´s no way escaping the crying-eyes-effect. Get the Crew some Jobs. And Beers. As we have been preparing this dish during our cruise, cooking in the evening was always a big social event. We sat together in the saloon, had a couple of beers – to enhance appetite – and could talk about the events of the passing day, sailing-related stuff or simply other topics (and it would always end in politics, which can be a trap, depending of the amount of beer consumed). Yes – we need Carrot Cubes. Second step is the mincing of the carrots. That´s really the secret of a good Sauce Bolognese. There are virtually hundreds of different recipes for this sauce and you may be able to alter ingredients and ratios the way you like it most. As for my family and Spaghetti á la X-Yacht, I will have one third carrots on two thirds minced meat. That means, if you have bought one kilogram of meat you will have to hackle 500 grams of little carrot cubes. That´s really all you ought to do in order to prepare this meal. The nice thing about it: It´s a tasty full-fledged meal but it can be prepared on a two-flame stove. 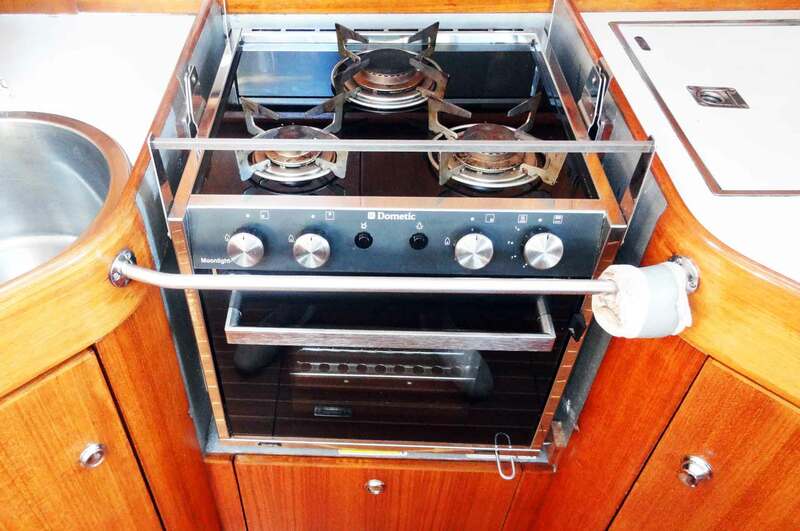 If you can keep the sauce hot, a one-flamed stove will also do. 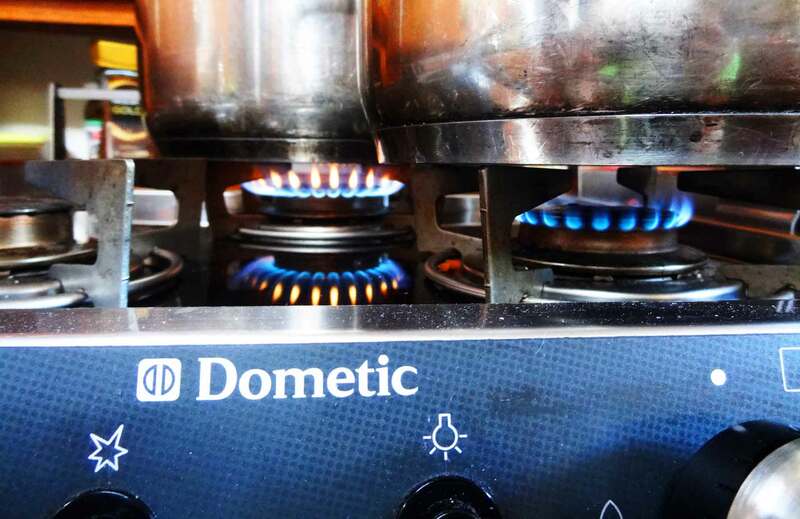 We have been lucky as the pantry of our X-442 was equipped with a Dometic 3-flame stove. The best thing about this one – it´s connected to the 12 V-electric circuit. Firing up this stove just requires pushing one button: No more burns and luxations by knottled fingers trying to fire up the stove with a lighter. That´s very comfortable cooking. Of course you are not going to torture crew and guests by simply offering a ready made-sauce, pre-cooked stuff from the food industry. We want a freshly prepared meal. So after mis-en-place preparing all needed ingredients you start by sweetening the minced onions. Beware: Onions in pans just need low-temperature. Depending on the onion, real hot fires will burn them and provoke a bitter taste. 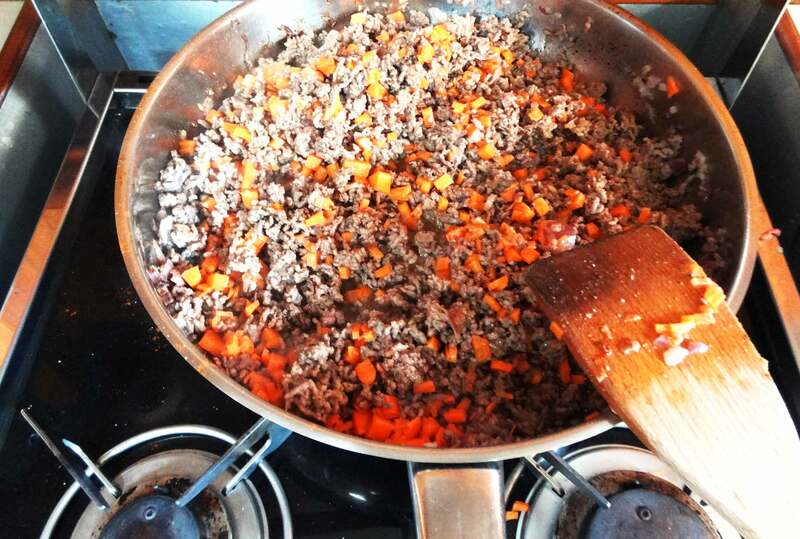 After some minutes you´ll add the minced meat and have it fried up until the raw meat is cooked. If you want, you may add a shot of Aceto Balsamico vinegar to the onions. Upon boiling this will further sweeten the onions and add a certain sourness to the sauce. 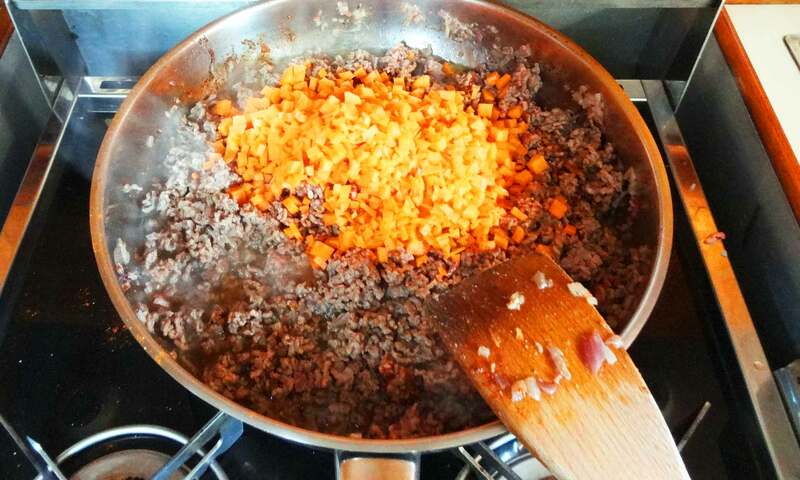 Adding the Carrots to the Minced Meat. Then it´s time for the carrots. Just as the meat is cooked, add the carrots and have everything seething thoroughly. We haven´t added any spices nor salt nor pepper yet. That´s the last thing we do upon preparing the dish. Let the meat-carrot sauce-base boil for some minutes. 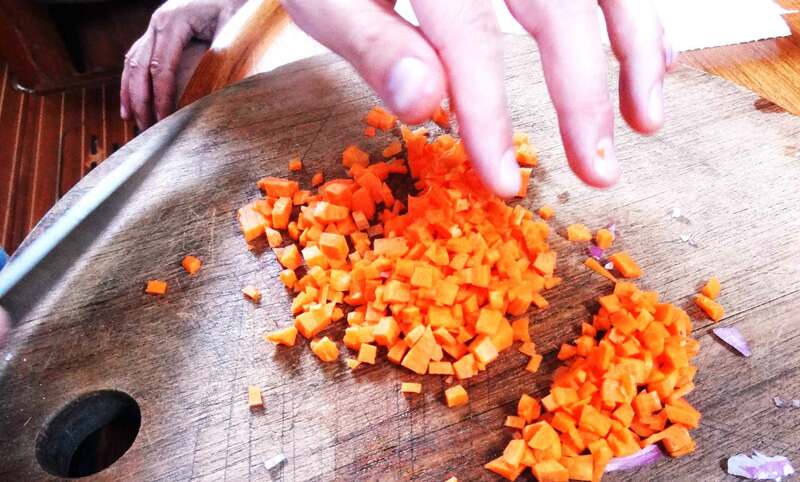 We don´t want the carrots to get too soft to have a certain “bite” in our dish, depending on the size of the meal you prepare, it takes 5 to 10 minutes. 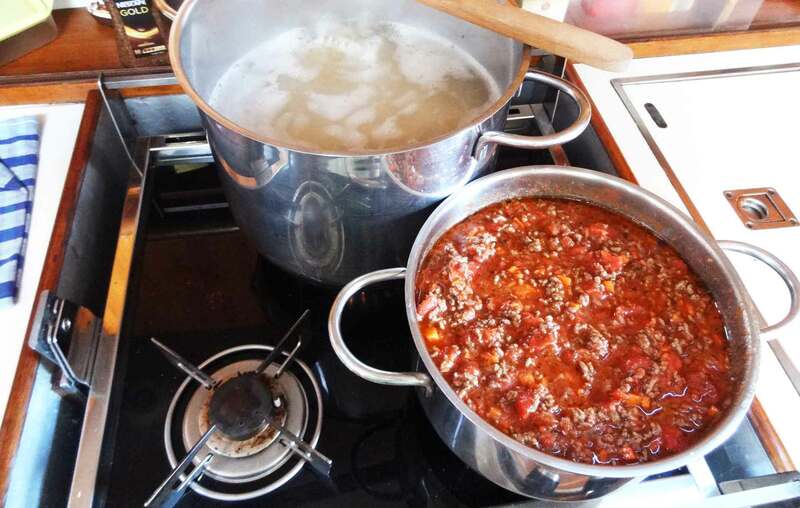 If you haven’t been able to get organic minced meat you´ll probably notice a lot of water in the pan. That´s awful. Try organic and be surprised: You haven’t paid for water but for meat. As for myself I only go for minced beef without mined pork as I do not like the flavor of pork. But that´s really a decision up to you and the individual taste of your crewmates and guests onboard. 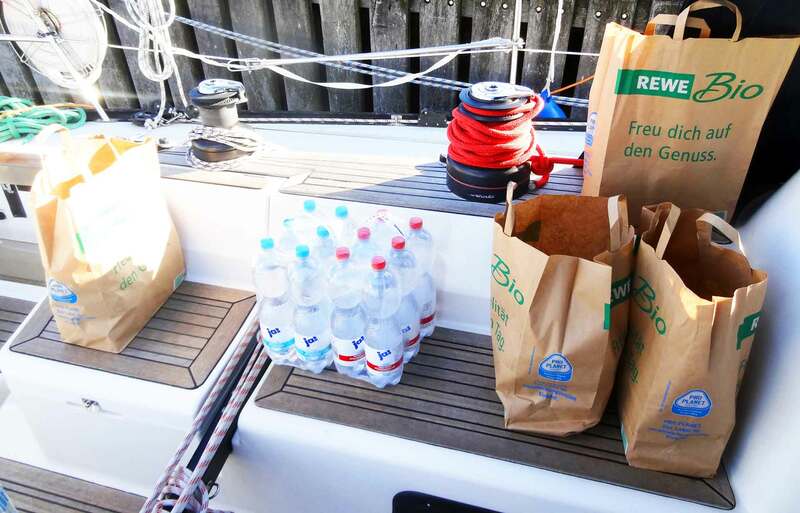 You crew mates haven´t been hungry yet? Well, at least at this point of preparing the dish the flavors of onions, meat and even boiling pasta will have flooded the whole ship and piercing through entryways and portholes: Irresistible! 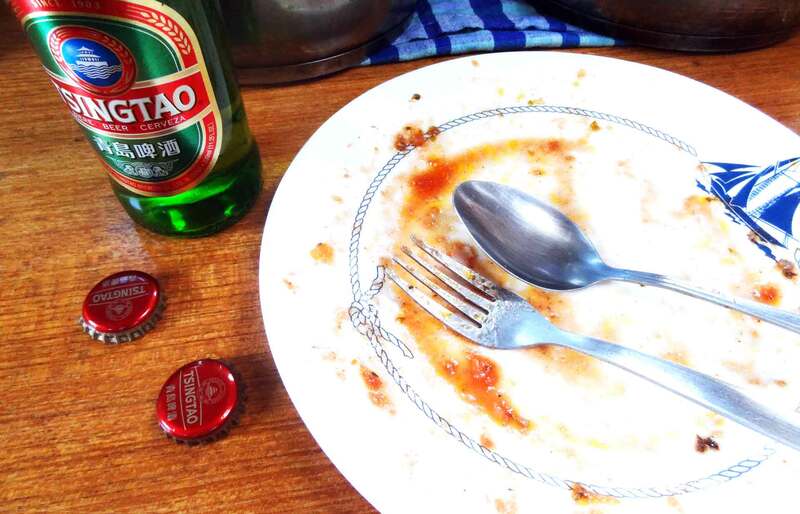 Get them (yet another) beer and have the dining table prepared with dishes – it´s just 10 minutes to yummy! You may now take a fresh pot and mix together meat-carrot-base and the sieved tomatoes. Now it´s time to spice up the sauce. We don´t need too much of it and not too many of different spices to have it taste like genuine Italian. Start by adding salt and black pepper. Again, fresh pepper from a spicemill is best. Pour some Oregano over the sauce. If you like, add another shot of Aceto Balsamico. And that´s basically all you need. 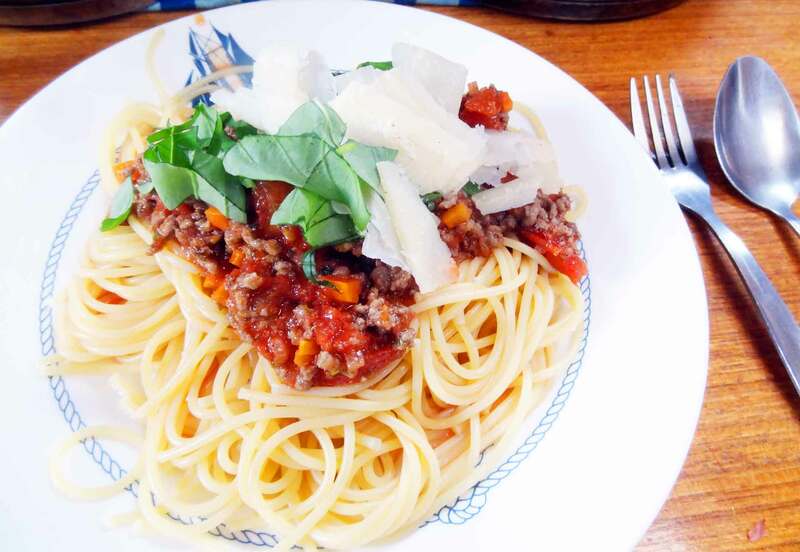 Have everything boiled once again and here we go: Sauce Bolognese á la X-Yacht is ready to be enjoyed. It´s just Minutes to Yummy! When the pasta is ready – it should have a certain bite as well and don´t cook it too long, we´re not 6 year olds anymore – you may teem the water and now add olive oil to prevent the pasta from sticking to each other. Then it´s time to arrange the dish: The base is a cluster of pasta with some sauce on top. Decoration is easy: Some rough chopped leaves of fresh green Basil and chips of Parmigiano Reggiano. Buon Appetito! I really love this recipe because it´s fast and very easy but nevertheless very tasteful. I´ve never experienced getting a dish back with leftover food. Spaghetti á la X-Yacht is both attractive for children and adults alike, will replenish stocks of your body, is full of energy and made with good organic ingredients. As for the crew of SY MERENNEITO, all dishes have been emptied after two consecutive additional servings (and yet even more beer) which is an accolade for the ship´s cook. This is how a Dish should look like after Dinner. Best thing about cooking? You are freed from the burden of cleaning up after the mess. We´ve had the deal that the cook may after the dinner proceed on deck to have half an hour of well-deserved spare time whilst the crew mates would have cleaned up the pantry and the saloon, made the dishes and stowed the leftover food in the fridge: Already prepared pasta is a perfect dish for having it warmed up when underway. Everything is shiny cleaned: Ready for the next Meal. When the galley is cleaned up and shining like brand new again it´s always a nice feeling: Having fed the hungry bellies of fellow crew mates with a tasty dish, looking into satisfied faces and knowing that down there in the fridge is some additional provision for a hot yummy snack when underway is a nice feeling – and the best thing the second most important man on a ship can hope for. I hope you like this recipe: Let me know if there´s something to alter. Congratulations for promoting organic food. 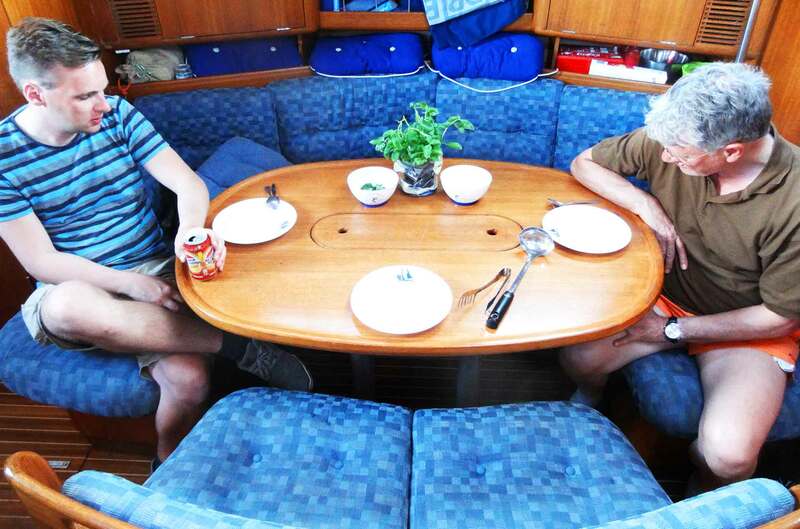 During our sailing courses at SAFE-Sailing we also cook as much as possible with organic ingredients – and it is worth it.